By peering into the eyes of mice and tracking their ocular movements, researchers made an unexpected discovery: the visual cortex – a region of the brain known to process sensory information – plays a key role in promoting the plasticity of innate, spontaneous eye movements. The study, published in Nature, was led by researchers at the University of California, San Diego (UCSD) and the University of California, San Francisco (UCSF) and funded by the National Eye Institute (NEI), part of the National Institutes of Health. "This study elegantly shows how analysis of eye movement sheds more light on brain plasticity- an ability that is at the core of the brain's capacity to adapt and function. More specifically, it shows how the visual cortex continues to surprise and to awe," said Houmam Araj, Ph.D., a program director at the NEI. Without our being aware of it, our eyes are in constant motion. As we rotate our heads and as the world around us moves, two ocular reflexes kick in to offset this movement and stabilize images projected onto our retinas, the light-sensitive tissue at the back of our eyes. The optokinetic reflex causes eyes to drift horizontally from side-to-side– for example, as we watch the scenery through a window of a moving train. The vestibulo-ocular reflex adjusts our eye position to offset head movements. Both reflexes are crucial to survival. These mechanisms allow us to see traffic while driving down a bumpy road, or a hawk in flight to see a mouse scurrying for cover. The two reflexes occur automatically as a result of signals from the brainstem, an evolutionarily older part of the brain. These reflexes also are precisely coordinated in relation to each other. When one of the two reflexes is impaired by age or alcohol, for example, the other compensates. This orchestration requires adaptive plasticity, said the study's lead investigator, Massimo Scanziani, Ph.D., who at the time of the study was professor of neurobiology at UCSD before moving to UCSF. Scanziani collaborated with the study's first author, Bao-hua Liu, Ph.D., a post-doc at UCSD and Andrew Huberman, Ph.D., now associate professor at Stanford University. Scanziani and his colleagues sought to understand the origins of this adaptive plasticity by studying the eye movements in mice before and after disabling their vestibular ocular reflex. In their mouse model, disabling the vestibulo-ocular reflex increases the optokinetic reflex. They measure the increase by holding the mouse's head still and then presenting the mouse with visual stimuli in the form of black and white horizontal stripes that rotate around the mouse. A camera records the animal's eye movements. More forceful eye movements indicate an increase in optokinetic reflex activity. 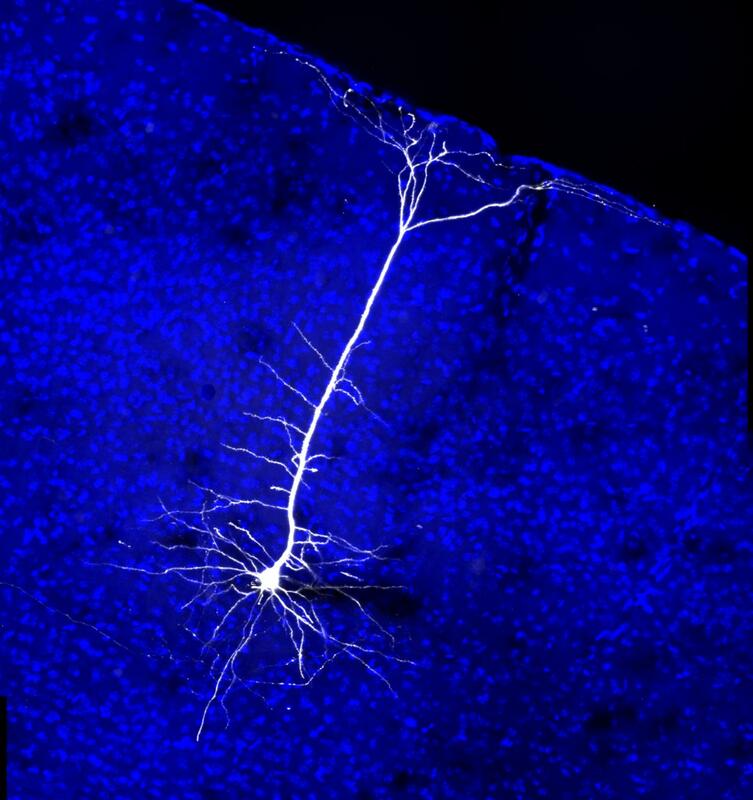 To test the visual cortex's role in the plasticity of these reflexes, the researchers applied a technique called optogenetics, which uses light to turn target cells on or off. The researchers targeted inhibitory neurons in the visual cortex to turn them "on," thus silencing that region of the brain. Silencing the visual cortex led to a significant reduction in the activity of the optokinetic reflex, suggesting that it is the visual cortex that is involved in mediating the plasticity between the optokinetic and the vestibulo-ocular reflexes. The findings shed new light on the role of the mammalian cortex in orchestrating eye movement, according to Scanziani. "Most of our reflexes are encoded in the brainstem, but from an evolutionary standpoint, the ability for one's cortex to modify these reflexes expands one's behavioral repertoire as the circumstances require," he said. "If you've ever noticed how people in an audience tend to cough after a solo musical performance ends, you've seen this ability to modify reflexes in action. It's an ability that appears to have been an attribute important for survival. After all when you're hiding from a tiger, it would be the very worst moment to cough." The study was supported in part by NEI grant R01 EY025668.